Over a century ago, the French entomologist Jean-Henri Fabre could lament that history "celebrates the battlefields whereon we meet our death, [but] it scorns to speak of the ploughed fields whereby we thrive; it knows the names of the kings' bastards, [but] it cannot tell us the origin of wheat" (The Life of the Caterpillar; Dodd, Mead and Company, Inc., 1916). Nowadays, however, humanistic food scholarship is so pervasive that one may legitimately worry about an imminent dearth of alternative food movements, pastoralist countercultures, terroir traditions and heirloom varieties left to investigate. Over forty percent of the book was penned by Atkins, whose nearly four decades of scholarship on the topic can be traced back to his doctoral dissertation on the historical geography of the London milk trade. Using once again the British metropolis as his primary case study, he discusses problems ranging from the safety issues caused by large cattle, sheep and poultry drives in urban streets to zoonotic diseases. Apart from food, clothing and transportation, he reminds us, urban livestock provided a wide range of non-edible inputs to a cluster of dirty and smelly industries that included soap, glue, candle, fertilizer, comb, saddle, glove, and industrial belt makers. Urban (mostly horse) manure was also once the primary fertilizer used in peri-urban market gardens, fields, and pastures, which in turn provided much of the sustenance of nearby humans and livestock. While Atkins has previously written on some of these issues, his contribution incorporates much recent scholarship and additional thoughts and insights. One of the most commendable aspects of Animal Cities is its minimal use of academic jargon. Unfortunately, its hefty price will keep it out of the hands of the increasingly large lay audience with a growing appetite for food history. Among academics, it will appeal primarily to urban and environmental historians, historical geographers, and the more down-to-earth "animal geographies" theorists. Proponents of urban agriculture as a community development strategy would especially benefit from familiarizing themselves with the book's content, for although the authors are supportive of this approach, their evidence is not. For instance, they remind us that once ubiquitous chicken coops eventually disappeared from urban backyards not only because of public health (from salmonella to zoonotic diseases) and nuisance (from smell to their propensity to attract rats) concerns, but also because the advent of more productive agribusiness and new work and leisure opportunities for urban dwellers meant that most people were no longer willing to spend a portion of their time producing food at a loss. Indeed, several North American cities already struggle with hundreds of abandoned urban chickens because their previous hipster owners were both overwhelmed by the amount of care they required and disappointed by the fact that they only lay eggs for two years (Sarah Boesveld, "Hipster farmers abandoning urban chickens because they're too much work," National Post, 9 July 2013). Also relevant for SPIN (Small Plot Intensive) enthusiasts is that the once greater productivity of peri-urban food production systems over their rural counterparts owed much not only to more intensive production practices (greenhouses, cloches, wind-breaking walls, large and specialized labor pool), but paradoxically to the much larger volumes of manure available in cities than in the countryside―a fact explained by the large volumes of animal feed imported from distant locations. Yet even before the end of the nineteenth century, the advent of superior fertilizers such as Peruvian guano and Chilean nitrates, more desirable employment opportunities for urban agricultural laborers, and new transportation (steamship and railroad) and preservation (refrigeration) technologies had essentially eliminated the economic foundations of urban SPIN. In the end, proximity to consumers and ever more abundant and cheaper horse manure (which in time became an unmitigated nuisance) simply could not overcome natural advantages and economies of scale in more distant locations. If anything, things are now probably worse in this respect than they have ever been. Unfortunately, the contributors to Animal Cities only begrudgingly draw what would seem unavoidable conclusions as to the importance of economic forces (as distinct from public health considerations) in removing livestock from urban environments. For instance, after observing that in many parts of the world today "fresh animal food production in urban settings is not only tolerated but actively encouraged," Atkins goes out of his way to point out that he "is not trying here to claim that there are strong parallels between British Victorian cities and the Third World today. But the mismatch of 'urban' and 'agriculture' in modernity came to be thought of as so strong that it is important to remind ourselves that alternative urbanisms are possible, where animal keeping is not outlawed" (p. 37). And yet, urban livestock disappeared in every urban agglomeration where significant economic development took place. There was in the end nothing fundamentally peculiar or unique about the cases discussed in this book, and similar chapters could have been written about other large western cities in the nineteenth century and more recent developments in East Asia. True, a new generation of enthusiastic animal keepers and some wealthy consumers are currently doing their best to reverse the tide of urban development, but the evidence provided in this book suggests rather unequivocally that the current urban agriculture craze will in the end be as socially significant as the hippie communes of a few decades ago. That the authors do not dare derive certain politically incorrect conclusions from their evidence, however, does not in the end undermine the quality of their contributions. 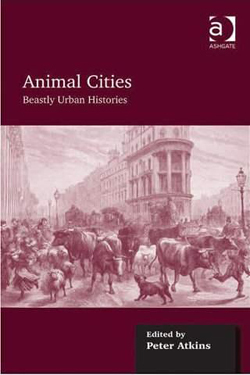 Animal Cities: Beastly Urban Histories. PETER ATKINS, editor. Farnham: Ashgate Publishing Limited, 2012. Pp. xiii+279, maps, diagrams, index. £65.00 hardcover. ISBN 978-1-4094-4655-2. *This review was originally published in Historical Geography 41 (2013): 180-182.